Want a cookie? 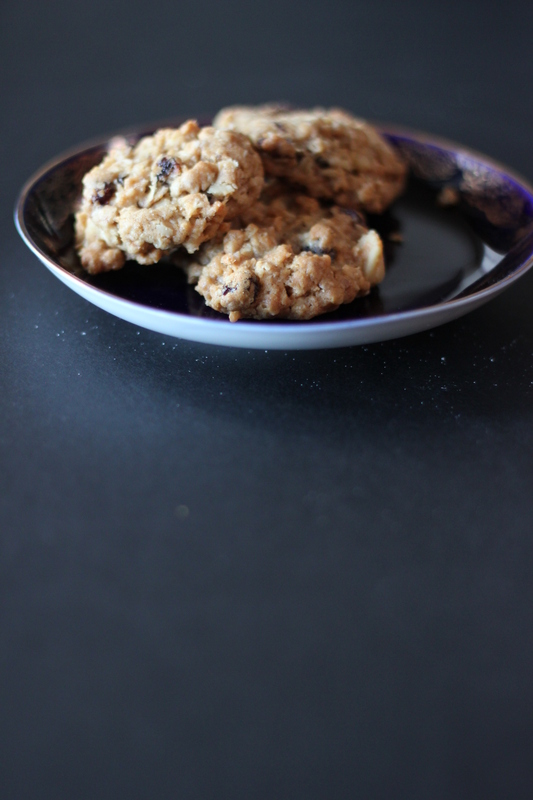 How about a soft oatmeal cookie studded with golden raisins and toasted walnuts? Hard to say “no” to that! This cookie combination was a third installment in the tradition of morning birthday cookies for the Artist. He’s been on the oatmeal kick lately, so these have seemed to fit in quite perfectly. The latest copy of the Allrecipes.com magazine ran a story on the most popular cookie selection, and I found the recipe for the Soft Oatmeal Cookies. 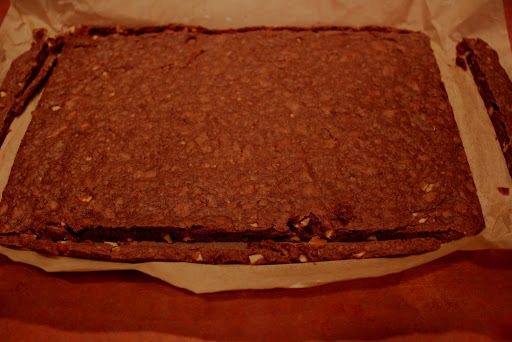 I halved the recipe and added the fruit and nut. These were a hit! 2. Add in the egg and beat together. 3. 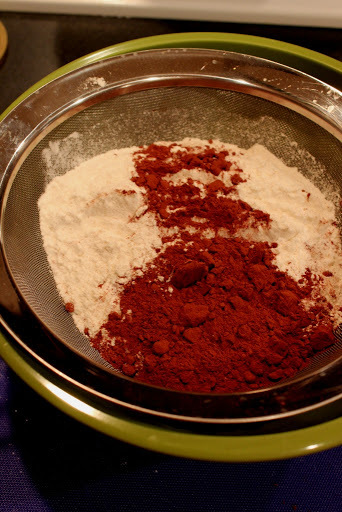 Stir together flour, baking soda, salt and cinnamon in a separate bowl. 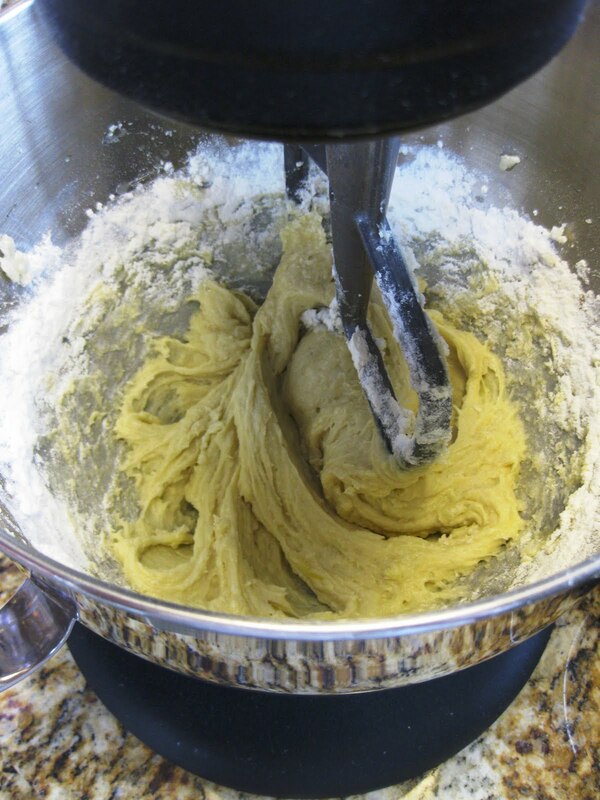 Incorporate the dry ingredients slowly into the butter mixture. 4. Mix in oats, raisins and walnuts. At this point, I refrigerated the dough overnight so it would be ready to bake in the morning. You can bake the cookies right away. 6. 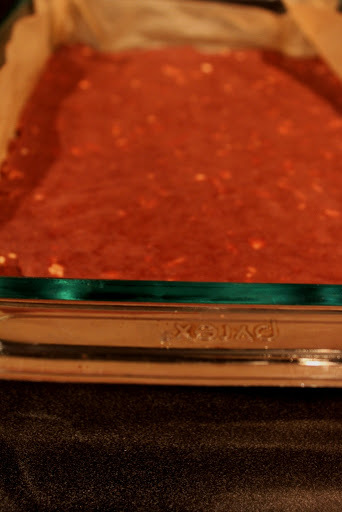 Scoop cookies on parchment lined baking sheets an inch apart and bake 8-10 minutes. 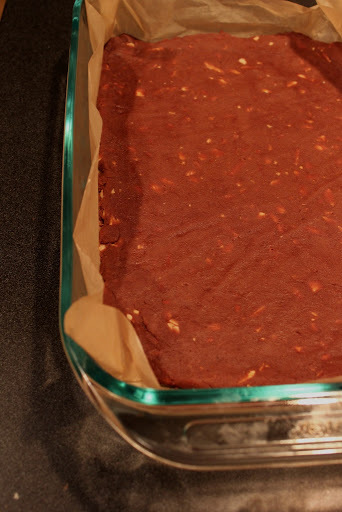 Transfer to a cooling rack (directly with the parchment paper) and let cool. Now all you have to do is sing “happy birthday” and pour in a cup of milk or glass. 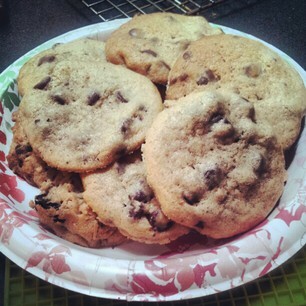 I would definitely bake these again. 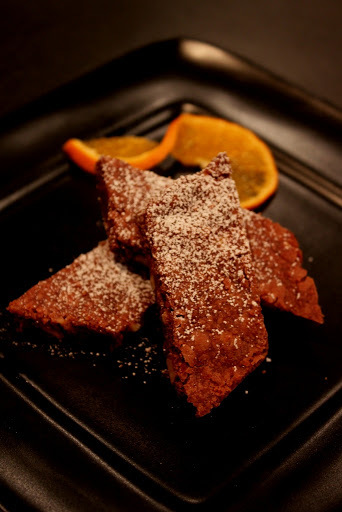 Chewy, sweet, healthy-tasting, with a nice crunch from the walnuts. 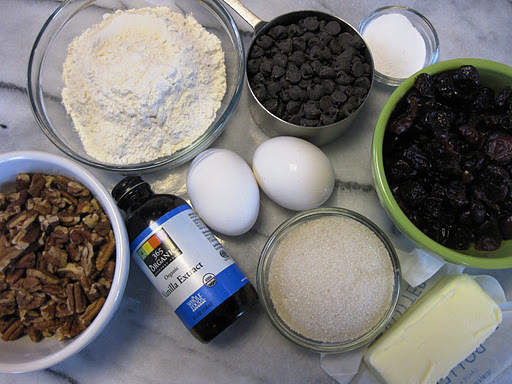 This recipe lends itself to many variations – how about pecans and dried cherries or pistachios and dried apricots? Give these a try! Why are the Snowmen sad? Because they are melting! 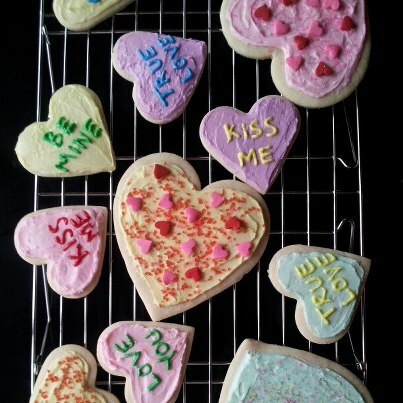 These just might be the cutest decorated cookies you will see this year. 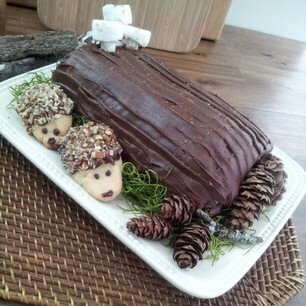 I got to work on this video with Allrecipes and decorate each one of these cuties, one by one. 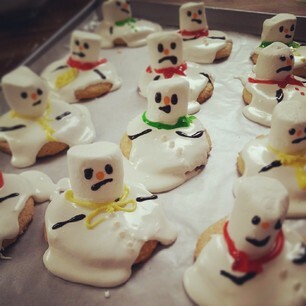 The recipe for Melted Snowman Cookies is easy enough. It uses two dozens of sugar cookies that you can bake and cool yourself, or pick them up from your favorite bakery. And since the cookies are covered almost completely by the icing, feel free to try this with chocolate chip cookies or oatmeal. When making the cookies for our video, we decided to skip the steps of microwaving the marshmallows. 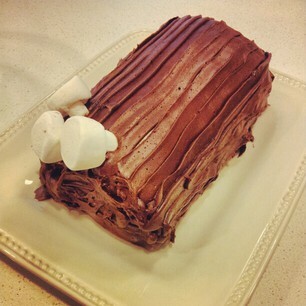 Ours looked droopy enough and easily stuck to the icing. This also saved us a few minutes – and who can argue with the saved time? The best part of this project is certainly decorating! Use your favorite colored decorating gels to add eyes, mouths, carrot nose, hands and outfit to each Snowman. I’d recommend making a few extra for practice. For a more believable presentation, we arranged these cookies on a bed of shredded coconuts and dusted with confectioners’ sugar. Let it snow! And may you have a very happy holiday season! For step-by-step directions, be sure to watch the video. Deep Fried Oreos with Allrecipes.com! Alright, so you wouldn’t eat these every single day, but on a special occasion, why not? We made multiple batches of Deep Fried Oreos at Allrecipes.com the other day, and let’s just say that everyone who tried these was a fan! Here’s the video for making this state-fair-favorite dessert. It’s on the homepage today! I remember when my family moved to our first house. We were just a few years into our adventures in the United States, still adjusting to the culture and traditions of our new country. I must have been fourteen years old. There was a knock on the door. A couple, middle aged, was standing at the door, holding a plate of cookies. “Welcome to the neighborhood!” they said. Fast forward many years. The Artist and I moved into our home. A few weeks later, there was a knock on the door and another plate of cookies, with sprinkles. Turns out that while we were on vacation, our neighbors moved away and we came back to a new family living next door to us. They mowed a strip of our grass and asked if it was ok to use our driveway to move in their piano. We exchanged a few words and our names. I found out I have a Russian accent, as if I didn’t know that already. 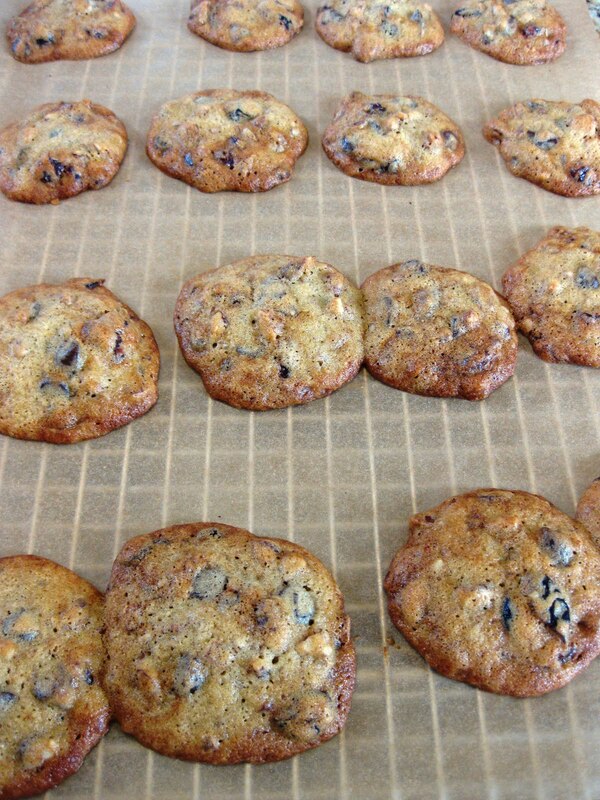 And then, I baked a batch of Chocolate Chip, Coconut, Cherry and Oatmeal Cookies to take next door for our neighbors. The tradition continues! As a major side note, this was the first time I used my generous and beautiful birthday gift from some of my dear girlfriends – thank you! 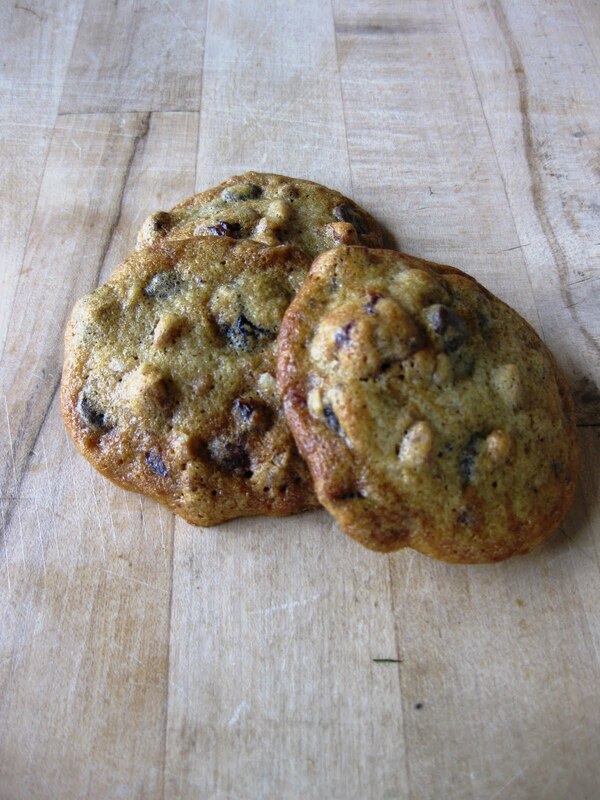 For the cookies, prepare a batch of chocolate chip cookies according to the 12 ounce chocolate chip bag. 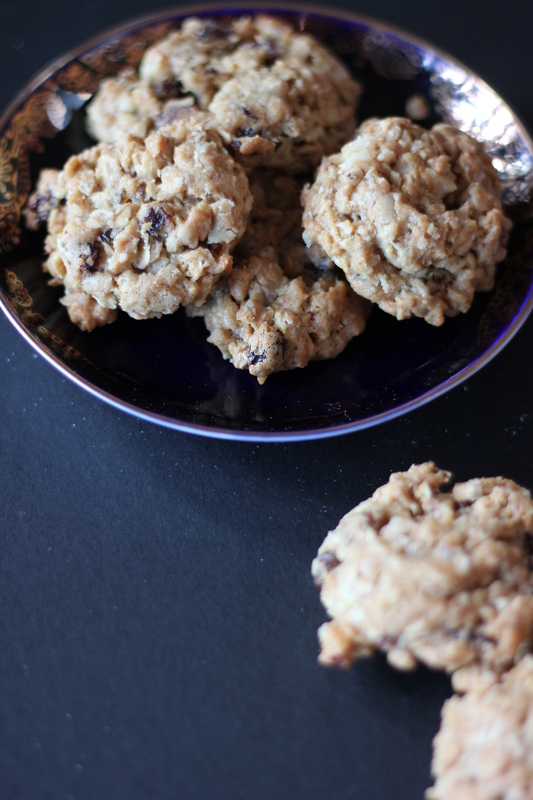 Mix in 1/2 cup of each: shredded coconut, dried cherries, and oatmeal. Bake according to directions. The extra cookies went to work with me and the Artist to share with coworkers. Want to share your favorite tradition or custom? 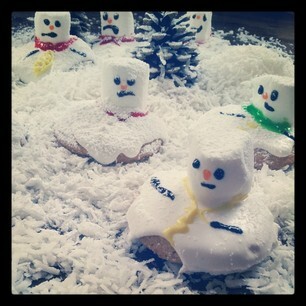 I might not be Martha Stewart, as much as I might want to be, but I do know a thing or two about cookie decorating. In time that it took a bunch of 5th graders decorate dozens of cookies, smearing icing everywhere in sight, and sneaking in an occasional chocolate chip or two, I decorated six cookies. 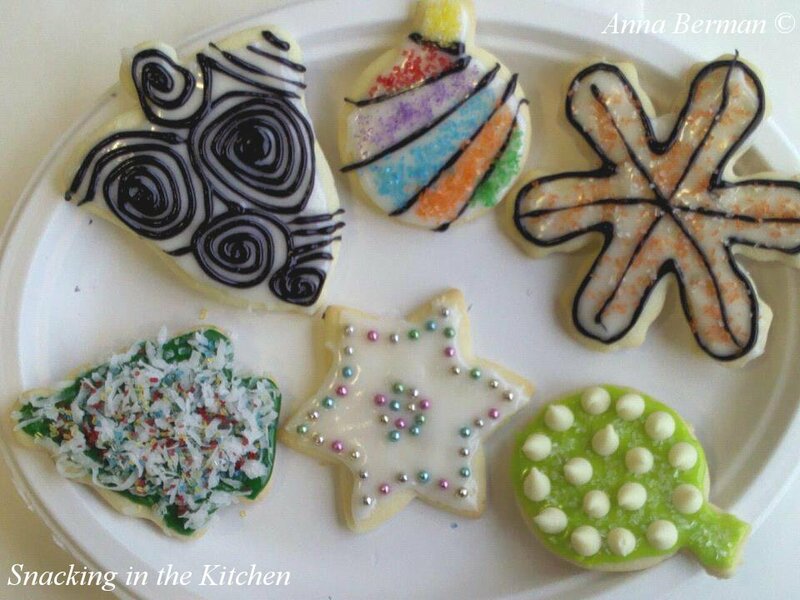 These cookies were decorated at Allrecipes for the Cookies Across America project. 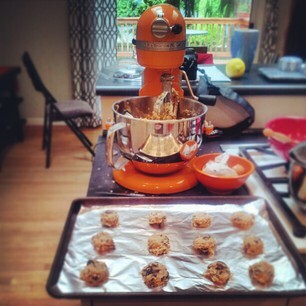 I am so excited to take part of Cookies Across America with Allrecipes and Nestlé Toll House tomorrow! I will be joining Allrecipes staff and a group of Seattle food bloggers to decorate cookies that will be later donated to Pikes Place Senior Center. For those of you who can’t make it tomorrow but still want to participate, please pledge to bake cookies during this holiday season and share them with those in need. 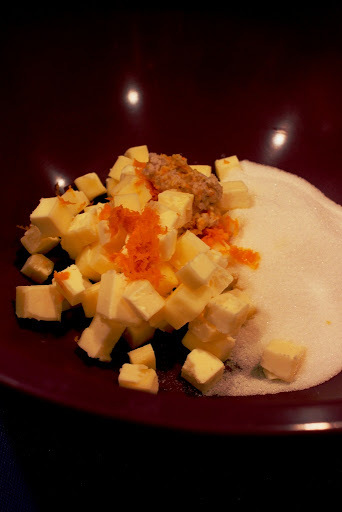 When I teach cooking classes, however, I often include a dessert recipe for my students. During one of my latest cooking classes, Summer Picnic, which included a Summer Picnic Potato Salad, I thought a cookie would fit right in. 1. Preheat oven to 350°F. Line two large baking sheets with parchment paper and set aside. 2. 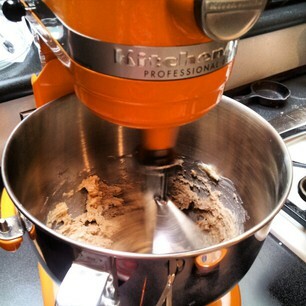 In a stand mixer, using a paddle attachment, cream butter and sugar until light and fluffy. Add eggs, one at a time, and vanilla. Continue to beat until ingredients are well combined. 3. Sift together flour, salt and baking soda to eliminate any possible clumps, combine ingredients, and add a little bit of air for a lighter cookie texture. 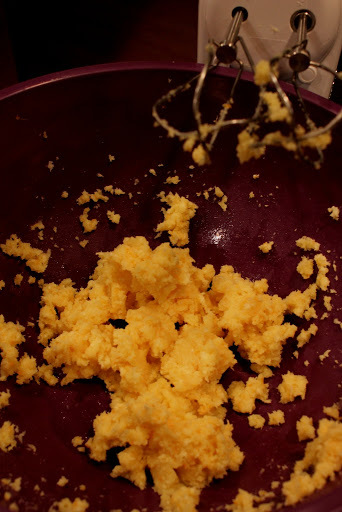 Add dry ingredients into the butter, sugar and egg mixture. Stir just enough to combine, do not over beat. 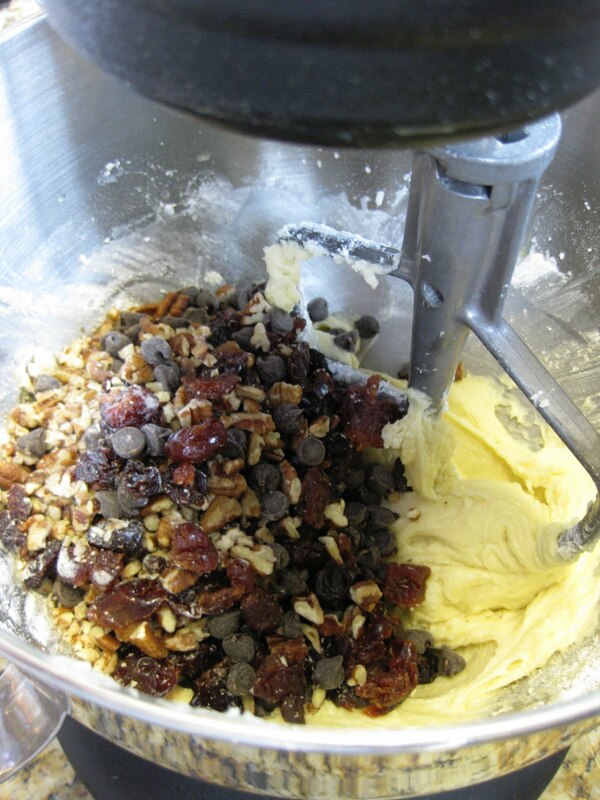 Add chocolate chips, sour cherries and pecans. Combine together. 4. 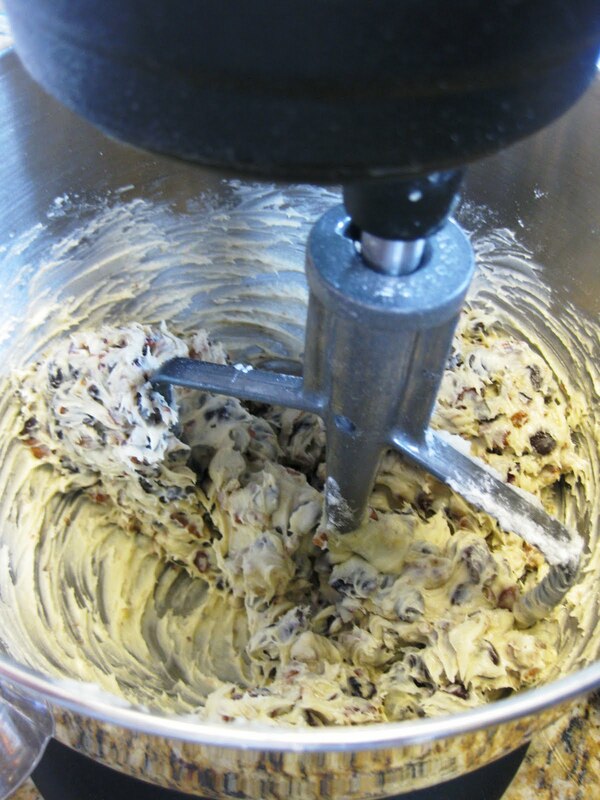 Remove the cookie dough from the bowl, wrap in plastic wrap and refrigerate for an hour. Without refrigeration, the dough is too soft and the cookies will spread out in the oven when baking. 5. Using a small ice cream scoop, scoop out the cookies onto the cookie sheets, leaving about 1.5-2 inches in between. 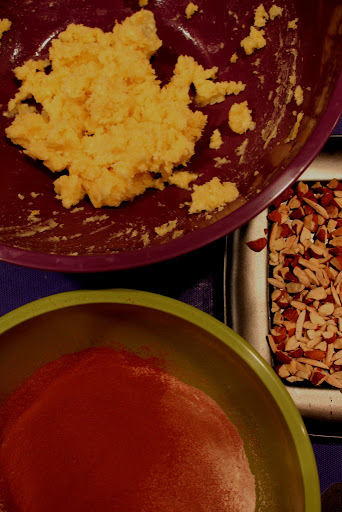 Depending on the size of the scoop you are using, bake the cookies 12-20 minutes. 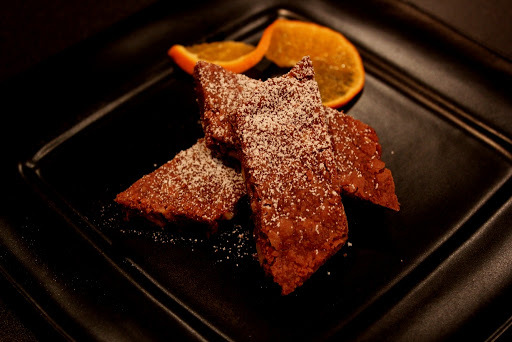 If baking both cookie sheets in the same oven, rotate them half way through the baking process to ensure even doneness. 6. 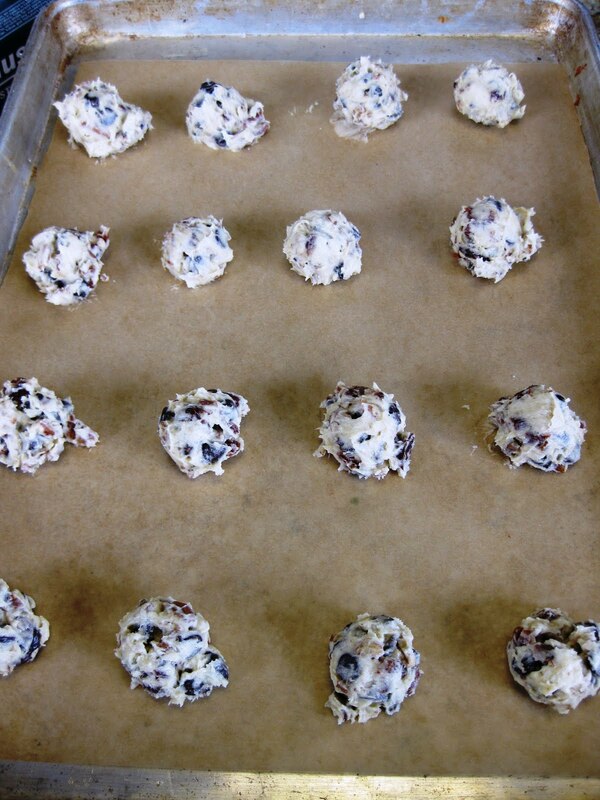 Transfer the cookies from the baking sheet to a cooling rack. 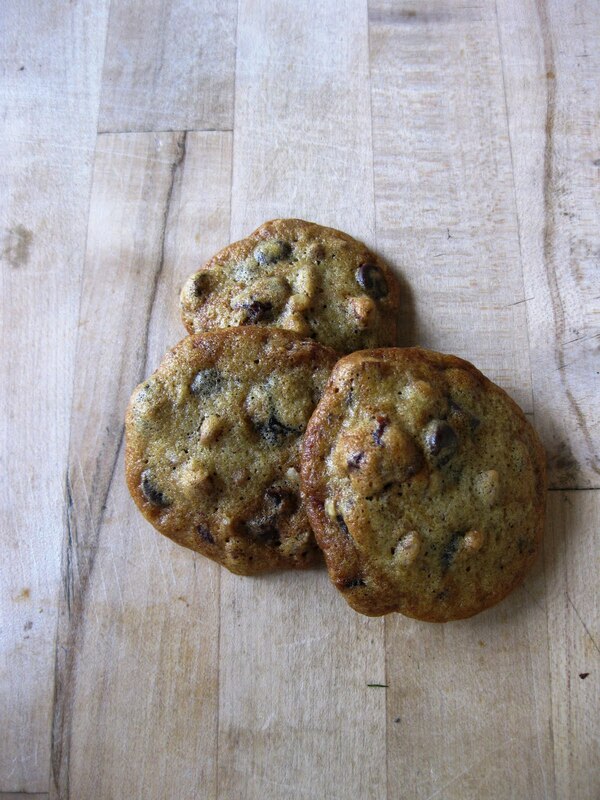 If you can resist, wait for the cookies to cool completely, otherwise, go ahead and eat! These were quite amazing! If you choose to use sweet cherries instead of sour, I suggest you cut down on sugar. Leave your pecans and cherries a bit chunky – your taste buds will thank you. Now, where’s my glass of milk?